Ayotte and DW are my personal favorites. i have an ayotte snare drum. very often at gigs i hear, "hey, can you turn that thing down"
The Gretsches of which Green T shirt spoke really did sound amazing. Agree with the comments on Slingerland. (I don't think they're bad sounding either) There's something nice about old drums style-wise. A new set of DWs are sonically better, but an old Ludwig Ringo kit just looks cool. I know you can order them in sparkle or whatever, but nobody really does and they always look kind of generic. yes they sound good too. HAVE YOU DRIVEN A " FORD " ( DRUMS ) LATELY ? mcleachy wrote: yes they sound good too. Those North drums have always cracked me up. Outside of seemingly not being so practical to store if needed (can't really stack them, can you? ), and slightly cumbersome otherwise... they remind me of Dr. Suess. I'll bet the projection is pretty good though. 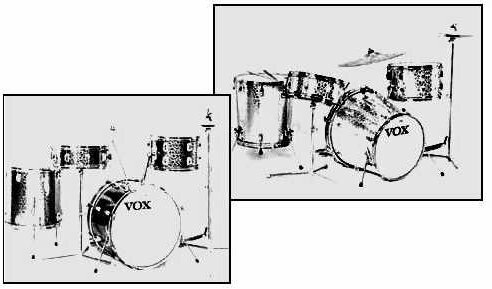 the old british arbiter accoustic drums. i was all about ayotte and dw before i gave these a real good look. amazing in everyway. (not just the one lug tuning) but the unbelievable maple shells that just sing. you cannot make these drums sound bad. too bad they only make the flats kits now. i think drummers just see something different tlike that and they shy away from it. not me...best kit i ever played. I really love the hardware and how easy it is to tune my Yamahas............but my Custom Maple DW's give me that warm fuzzy feeling in my lower belly like when you know its "business time"
I guess you gotta go with what you know. I love Yamaha drums....had a nice Studio Custom kit. But after 14 years of absolute torture on the drums & hardware, TAMA Star Classics are my favorite. Before I bought my drums I spent 2 hours at The House of Guitars - playing all different kits in the drum room. DW, Sonar, Yamaha , Pearl.... played a shitload of different kits....I played the TAMA Star Classic Maples & fell in love. I bought the Performer series to save some money.... My Star Classics sound just like the day I brought them home. A durable brand of drum. Their hardware is so reliable. I have no beefs with Tama at all. I'm sure all of the other make are nice, but my kit has taken such a beating & it keeps going & sounding awesome. Need a Car??? Come see me & let me help!